Wait a minute – there’s no online shop – how do I order? You will notice whilst browsing my site that there are no drop down boxes for you to fill in, no checkout and no nervous wait for three weeks to see what arrives in the post! This is all intentional. You are buying a unique, personalised piece of special jewellery – more special than impersonal drop down boxes and checkouts. One of my clients once said about her buying experience ‘I felt like a film star having a piece of jewellery made especially for me’ – she was thrilled at the personal way in which her needs and expectations were handled. I want all my clients to feel like this, so we do it personally and we do it together. We make contact by the means you feel most comfortable with – whether that be Facebook/Messenger, by telephone or by email. We talk about what you like and don’t like and come up with a design for you. If you need time to think – I won’t push you to order. 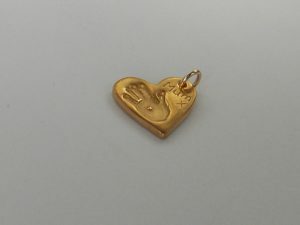 I’ll give you all the information you want, answer any questions you may have and then wait for you to decide if and when the time is right for you to purchase your unique piece of keepsake jewellery. Payment can be made by cash, cheque (which will need to clear before I start making your piece), bank transfer or PayPal. I will give you the relevant information once you have decided how to pay. Payment plans are a great idea to spread the cost over four months (any more than this and I would have to set up legal credit agreements) and are ideal for special occasions like Christmas. You need to make a first month initial payment of £20, followed by the balance split over the remaining three months (for example an £80 piece with £20 paid in May, followed by £20 per month in June, July and August). Once full payment is received, I will start making your jewellery. Christmas payment plans need to be set up by July at the latest so payment is completed by October giving me time to plan your piece in to my busiest time of year. How do you take prints? Once you place your order with me, I will send out a print kit in the post – there is a £10 non-refundable charge for this so please be sure you are ready to commit to an order. I will send you a Paypal invoice and once its paid, I will post out your print pack. It is very easy to use and comes with full instructions, but I’m at the end of the telephone if you have any problems so just give me a quick call and I’ll talk you through it. Enclosed will be a short order form along with my terms and conditions and a pre-paid envelope for you to return your prints to me. As of 2018 I no longer make home visits. Can I use prints I already have? Of course! You may already have some special hand, foot or paw prints and I can work from a scan of these so they don’t even have to leave your home. Email them to me at fran@lillylocket.co.uk and I’ll let you know as soon as possible if I can use them. For hand, foot or paw prints there is no upper or lower age limit – yay! For fingerprints – this is the million dollar question! Fingerprints develop individually and one of the most frustrating parts of my job is that I can’t make people have good, clear fingerprints. A good guide for children is after 12 months of age when their little fingerprint definition should be clearly visible and good enough to fingerprint. I cannot improve or alter the fingerprints so what you see in the mould is what you will get, whether that be a clear print or a finger ‘impression’. It is therefore vital that you are happy with the print before I start working on your piece. 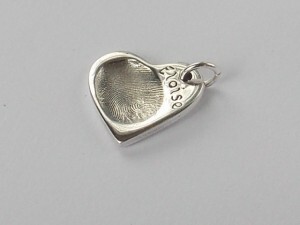 As each child is as unique as this jewellery – their fingerprint definition will be unique too. Some children just naturally have better fingerprints than others. Similarly, as you age and your skin becomes thinner, your fingerprint definition can deteriorate, so it can be tricky getting good, clear prints from the elderly too. If you can clearly see a good print and are happy to progress, please contact me but do bear the above in mind. If I really don’t think I can use a print, I’ll call you and we’ll discuss other options. Can I have my piece engraved? Yes! There is a choice of inscribed or stamped text – please indicate your preference on the order form. Depending on the size and shape of your piece, there may be space for an initial only, or for a name and date of birth or another short message. Can I have a print on both sides? Yes! There may be limited space for text but double sided pieces are a very popular choice – just add £15 on to the price of single sided pieces. Can I have my prints ‘popping’ out? Yes! Its just as easy to do a relief print as an imprint. My only recommendation is that if you have a ‘Generations’ pendant, the relief piece is the smallest one at the front so it doesn’t get worn away knocking against pieces in front of it. What is the difference between .925 Sterling Silver and .999 Solid Silver? .999 Solid Silver is 99.9 parts silver – silver in its purest form. 925 sterling silver is 92.5 parts solid silver and 7.5 parts copper. The addition of copper makes a really hard wearing piece that can withstand scratches, bumps and knocks much better than .999 solid silver can. It is personal preference which silver to choose, however I usually make all pieces in the purer .999 solid silver. The cost is the same for either as although Sterling Silver is slightly cheaper than solid silver, it needs to go through a two stage firing process, whereas .999 only needs a single stage firing. .999 Solid Silver is silver in its purest form, therefore should be suitable for those who have any allergy to other silver. All attachments, unless otherwise stated, will be .925 sterling silver. How do you do 24K Gold plating? If you would like your piece 24K gold plated like this……..
please let me know as it is available on most pieces. All my pieces are sent to a professional plating company in Yorkshire. What is Hallmarking and will my piece be hallmarked? In the UK it is illegal to sell or describe any item as Gold, Silver, Platinum or Palladium unless it is hallmarked*. A UK hallmark struck by an independent assay office guarantees the precious metal content of the piece you are buying. *Exemption weights exist and pieces below the exemption weight are not required to be hallmarked by law. I am registered at Sheffield Assay Office for the hallmarking of all my pieces that are above the exemption weight. If it is necessary to hallmark your piece, this will be outlined in the product description and included in the price of the piece. Average turnaround for hallmarking is 10 working days, therefore it may take up to five weeks from receipt of your prints to delivery of your finished jewellery. I aim to dispatch all orders within 21 days of receipt of the prints back to me. I’ll keep you updated every step of the way with progress photographs and the chance to amend something if it’s not how you pictured it or to your liking. During peak times, dispatch times can increase by a further two weeks. Peak times and cut off dates are detailed on the homepage. There may also be a delay during school holidays – I work my businesses around my family, so I usually work one day a week during school holidays. If you have an urgent deadline, please do talk to me and I’ll see what I can do. A fast turnaround of 7 days from receipt of your prints to delivery back to you is available at an additional cost of £10. If, unfortunately, I cannot meet your timescale, I do have gift vouchers for any value that can be given in place of the actual piece. The recipient can then also be involved in the making process. You may collect your piece free of charge from me – Barlborough Village, Chesterfield. It is an additional finish I offer and is somewhere in between brushed satin and mirror shine. Antiquing is intentionally tarnishing a piece of jewellery with a solution called Liver of Sulphur. It smells gross – like rotten eggs but worse! Your piece is covered in LoS which takes it through a rainbow of colours to total black. 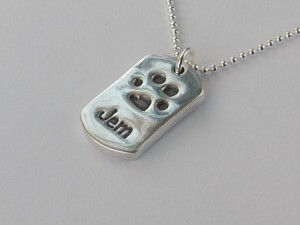 The remainder of the piece is polished back to silver and the areas that are left tarnished will make your prints stand out against the silver like Jem’s paw print pendant above. 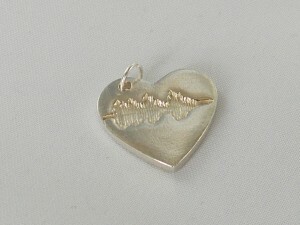 You can also choose to leave your print silver like the cut out hand and sound wave prints above. 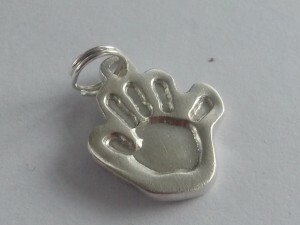 .999 Solid Silver is quite a ‘soft’ metal, so the strength and finish is never going to be that of .925. Your .999 piece will undergo a polishing process that will give either a brushed matte, tumble polished or mirror shine finish, but it will never be ‘flawless’. By the very nature of .999 Solid Silver, it is not possible to achieve a scratch free flawless finish. Your piece is handmade so it may not be millimetre perfect or totally symmetrical. This is all part of having a bespoke piece of jewellery made – your piece is unique and not made on a production line along with thousands more like it. There won’t be another one like it in the world – even if I did a duplicate piece using the same prints, they would both have differences! Enjoy the individual character your piece will have. Your piece will tarnish and scratch over time, so please remove it when doing anything manual that may harm it or cause you to sweat. Please also remove during bathing or swimming. Do not spray lotions or sunscreen on your piece. Do not use silver dip on your piece. Your jewellery will come with a small piece of white anti-tarnish cloth which should be used to clean any tarnish that will appear over time. Do not use this on antiqued areas – this is intentional tarnish which the abrasive cloth will remove. It will also come with a silver polishing cloth which can be used to polish up your piece after washing it in warm water and mild detergent. Please keep you jewellery in the box provided when you aren’t wearing it. Check regularly for signs of wear and tear on chains and links to prevent accidental loss. Bracelet charms, rings and key rings will show signs of wear and tear faster than a necklace will. If you see signs of stress or weakness, please stop wearing your piece and make contact as soon as possible. Should anything accidentally break, please let me know as I can often carry out repairs and provide replacement chains and links for a nominal cost. I am, however, unable to replace items which have been damaged or lost due to misuse. Please be honest with me if you have broken something – I don’t get replacements for free so if you don’t ‘fess up and pay for it, then I have to. I’m fair and reasonable and expect you to be the same. What happened to my prints when my jewellery is finished? Your original prints and the stamps or moulds used to create your unique jewellery will be returned to you with your finished piece. I hope you wont, but you are therefore free to use another fingerprint jeweller to create further pieces using these prints, however I offer a 5% discount on subsequent pieces made using the same prints.